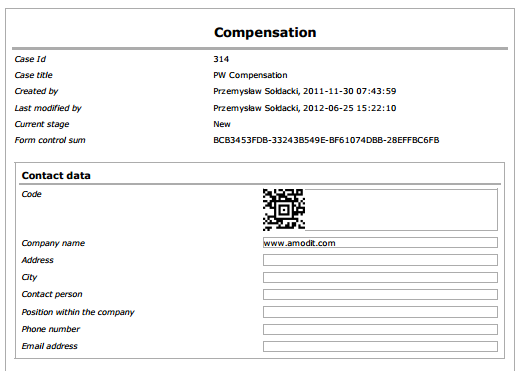 Recently AMODIT was equipped with 2d barcodes support. To add it to a form you simply create a field of a type "Barcode". Then you can define from what fields values are to be taken to generate a barcode. For example "[VendorID] [ProductId]" means to get values from two mentioned fields divided by blank, and generate code from it. You can then use this code to quickly input data from code to other system. Or just generate code with case ID and then use it to find electronic version on a basis of the printed code. Now Aztec codes are supported but shortly we will add other codes like 1D and QR. Below you can see example of code generated from a field [Company].